The December 2013 jobs reported recently released by the U.S. Bureau of Labor Statistics shows, on paper, a steep decline in the unemployment rate, to 6.7 percent, versus 7 percent for November. Yet, not even the usual happy chorus was cheering what, on the surface, was positive economic news. The BLS also showed that a mere 74,000 jobs were created in December by the U.S. economy. Depending on various statistical measurements, the American economy must produce at least 150,000 jobs per month, and more realistically 200-250,000 just to keep even with the normal flow of new entrants into the U.S. labor market, based on natural population growth. In other words, based on the statistic of 74,000 jobs created in December, the actual unemployment rate in the United States should have increased rather than decrease. The reason why the official U.S. unemployment rate dropped to 6.7 percent is that a large number of long-term unemployed Americans have left the job market, either voluntarily, or arbitrarily based on the BLS statisticians deciding not to count them among the officially unemployed. The official numbers can be ignored; in truth the United States continues to suffer the ravages of high unemployment-and underemployment-nearly six years after the onset of the global economic crisis. Despite the attempt by statisticians to bend and twist the employment numbers to create the illusion of robust job creation in the United States, even those manipulated numbers could not conceal the bitter reality; the U.S. has effectively zero job creation, with 150,000-200,000 additional job-seekers coming into the labor market each month. Officially, the American unemployment rate rose to 9.2 percent, while more credible unofficial estimates exceed 20 percent. The structural mega-deficits have failed to increase employment in the United States, and now President Obama and Congress are deadlocked on the issue of raising the debt ceiling. The ugly truth is that America is effectively insolvent. It can only pay interest on its debts by accruing more debt. This cannot end well. In a surprise and disturbing development, weekly unemployment assistance claims in the United States have reached 474,000. This is the largest weekly jobless claims report in eight months, and an increase of about ten percent over the prior week, despite predictions by economists that this week’s jobless report would actually show a drop in unemployment claims. The current report is a major negative shift from several weeks earlier, when jobless claims dropped below 400,000. The unexpected and rapid acceleration in jobless claims is a clear indicator that the U.S. economy remains mired in deep crisis, with persistent and historically high rates of unemployment. With the Obama stimulus expenditures running out of steam, a Republican dominated Congress unwilling to further increase deficit spending for more stimulus, and the Federal Reserve’s massive monetary intervention proving to be ineffective in facilitating job creation, all the signs are that the American economy is headed for a double-dip recession. Contrary to the expectation of pundits and economists, May’s employment numbers released by the U.S. Labor Department are an unmitigated disaster. At first glance, though, the uninformed would think that the vast deficit funding on economic stimulus by the Obama administration was working. Supposedly, “employers” added 431,000 jobs, and the overall U3 unemployment rate dropped to 9.7%. However, the so-called “employers” consisted almost entirely of the U.S. federal government, which added 411,000 temporary census jobs in May. These jobs, which will disappear in a few weeks, are responsible for about 95% of the claimed job creation in May in the United States. In May, according to the government’s own data, private sector job creation was statistically insignificant. I personally believe, based on past patterns, that the U.S. government statisticians consistently over-report private sector employment in most of the initial monthly tabulations. One other factor should be noted. The drop in unemployment from 9.9% to 9.7% was due not to vast job growth in the U.S. economy, but rather due to the fact that 322,000 unemployed workers were eliminated from the officially counted workforce. In fact, when one counts this category of so-called discourage workers, in addition to part time workers unable to find preferred full-time employment, the more inclusive U6 unemployment rate is close to 20%, or one in every five U.S. workers. With continuing high rates of unemployment, it is clear that there will be no consumer-led economic recovery in major advanced economies. This means that massive government deficit spending is the only means of propping up national economies. However, with the global economic crisis rapidly mutating into a virulent sovereign debt crisis, the option of public pump-priming clearly has its days numbered. The U.S. Labor Department came out with the latest official jobless figures, showing that unemployment has now reached double digit territory: 10.2%. However, shortly after this grim milestone was revealed, The New York Times had a front page headline that proclaimed the actual unemployment rate was 17.5%, meaning one in six American workers was either unemployed or forced to take a lower-paying part-time job due to the unavailability of a suitable fulltime position. Since 1961, the Bureau of Labor Statistics has excluded discouraged workers from the official unemployment count, disseminated as U3. The more inclusive U6 unemployment figure, published in The New York Times, stands at 17.5%. However, there are other estimates that indicate true unemployment in the United States stands in excess of 20%. More important than the competing unemployment figures in the change in total labor income, equivalent to the gross number of hours worked multiplied by the mean average hourly wage. Over the past year, hours worked in the United States has declined by 7%, simultaneously with wages being frozen or reduced. In an economy dependent on the American consumer for more than 70% of GDP, these statistics do not augur well for a sustained economic recovery in the U.S., despite the official boasting of “green shoots” on the horizon. The Department of Labor’s report on unemployment for September was just released, and it came as a dismal surprise to those proclaiming an end to the recession. Instead of a further reduction in lost jobs, the number actually increased in September. According to the Department of Labor, a net total of 263,000 Americans jobs disappeared in September, taking the official U.S. unemployment rate to 9.8%, its highest level since 1983. In addition, the average workweek was reduced to 33 hours, the worst showing since the end of World War II. Those are the official numbers. However, when one looks at the real unemployment numbers, factoring in discouraged workers and the underemployed, the numbers are in excess of 17%; some estimates rank as high as above 20%. While the government can manipulate the unemployment statistics all it wants to artificially deflate the actual rate of unemployment, there is one number that cannot be played with; tax receipts. Fewer employed Americans mean less tax revenue for Washington. The U.S. federal government’s tax receipts are down by more than 20%, while spending is soaring to record levels. If this is an economic recovery, it is heavily disguised. Since the current recession officially commenced in December of 2007, more than five million Americans have joined the ranks of the unemployed. However, as bad as the official statistics clearly are, the underlying reality is actually much worse. For one thing, the Labor Department no longer includes “discouraged” workers in its unemployment figures. In addition, the underemployed are also excluded. This latter category reflects the somber reality that millions of Americans have been forced out of full-time employment, and can only find part-time jobs with much lower salaries and benefits. When these missing pieces to the unemployment picture are aggregated, the actual unemployment rate in the United States is a staggering 15.6%, which fits in the mid-range of the unemployment rates that the U.S. encountered during the years of the Great Depression. 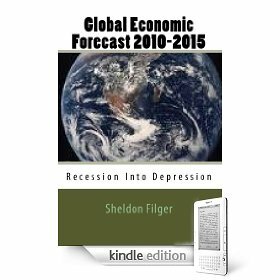 Amid all the uncertainty clouding the global economy and its fate, one thing is certain: the massive rise in unemployment rates throughout the world will facilitate further demand destruction, which in turn will lead to further job losses, as a vicious self-perpetuating engine of economic destruction runs amok. Recall that the initiation of the Global Economic Crisis began with a collective failure to pay the monthly bills on subprime mortgages, at a time when the United States enjoyed record levels of employment, and an official jobless rate below 5%. With the likely impact of rising levels of unemployment on the securitized bank assets based on near-prime, prime and commercial mortgages likely to be highly negative, it would appear that the current “sucker’s rally” on Wall Street is just another manufactured asset bubble waiting to implode.